Two guys in a close friendship is one thing, but a bromance? That’s on a whole other level. Bromances come in all forms. They can be chest-bumping, testosterone-filled buddies like Dwayne Johnson and Jason Statham’s titular leads in the upcoming Fast & Furious franchise spinoff Hobbs and Shaw or they can be a little goofier and unpredictable, like the hapless pals of The Hangover franchise. One thing they all have in common, though: These guys work together like peanut butter and jelly. In honor of these great on-screen duos, here are some of our favorite bromances from movies and television. Played by Danny Glover and Mel Gibson in the Lethal Weapon film franchise, these mismatched detective partners – one a veteran cop looking for a quiet path to retirement and the other a dangerous loose cannon — were initially at odds with one another, but they grew to become total bros, watching out for each other in one life or death scenario after another. The characters were brought into the present day via a Fox television series of the same name starring Damon Wayans and Clayne Crawford. Seann William Scott replaced Crawford in a new character role for season 3, breaking up the official bromance. But we’ll always remember Murtaugh and Riggs as one of the best on-screen, buddy-cop duos of all time. No one can “party on” like Wayne and Garth. 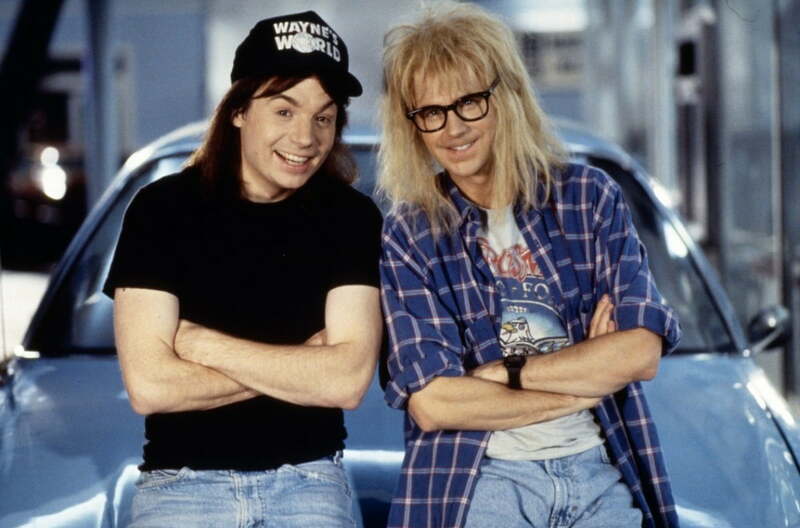 Wayne (Mike Myers) is the yin to Garth’s (Dana Carvey’s) yang. While Garth is shy and awkward, Wayne is totally outgoing — but when they get together to host their public access show and discuss their mutual love of rock, hockey, and corny jokes, it’s a most excellent, schwing-worthy bromance. When it comes to these two dummies, lack of intelligence is part of their charm. Harry (Jeff Daniels) and Lloyd (Jim Carrey) feed off one another’s stupidity and immaturity to hilarious effect. We even saw them team up again 20 years later in the 2014 sequel, Dumb and Dumber To. In that film, Harry stays by his friend’s side, even though Lloyd delivers the ultimate (and most ridiculously dumb) prank by pretending to be incapacitated in a mental institution for decades, watching Harry dutifully come to visit every week. Gotcha! What would Captain Kirk be without Spock? In arguably one of the first great television bromances, Kirk (William Shatner) is brash and impulsive while Spock (Leonard Nimoy) offers calm and logic — balancing each other out. The bromance is all the more beautiful given that, as a half Vulcan, Spock shouldn’t really have the capacity to feel such complex emotions for his buddy. The torch has been reignited in the new film series, with Chris Pine and Zachary Quinto playing Kirk and Spock respectively. 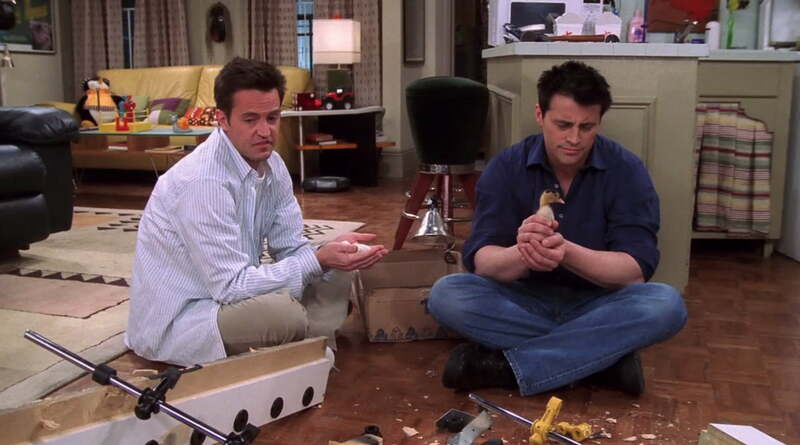 Roommates and besties, they argue like brothers, usually with Chandler (Matthew Perry) playing the role of sarcastic father figure and Joey (Matt LeBlanc) the dimwitted man-child. Despite their very different styles and interests, when they get together, it’s pure fun, whether they’re chilling in front of the TV on matching recliners with beers in hand, or trying to pick up ladies in the coffee shop. It might appear that Ferris (Matthew Broderick) is far too self-involved to care much about his brooding bestie, Cameron (Alan Ruck). Upon further inspection, however, Ferris really helps his high school BFF come out of his shell, live life, and stop being so uptight. 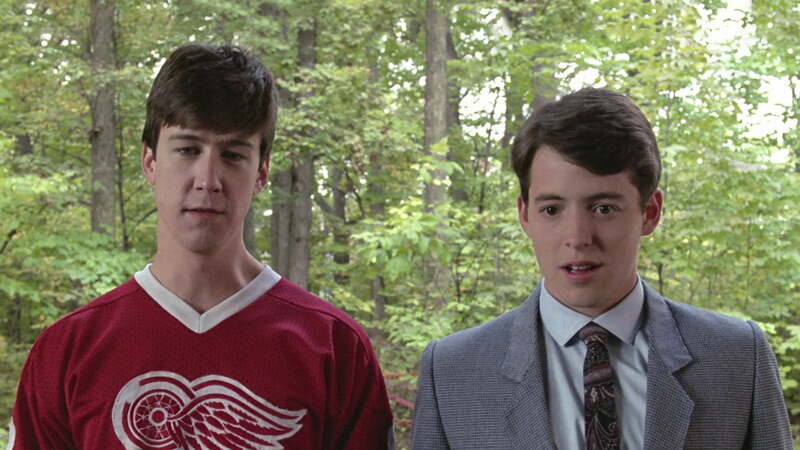 In a movie that takes place over the course of one fun-filled day, Ferris and Cameron’s bromance just doesn’t get the screen love it deserves. It’s no wonder fans were elated when Will Smith confirmed that he and Martin Lawrence would be reprising their roles for Bad Boys for Life. The duo – one a family man and the other a lifelong bachelor — are a match made in buddy-cop heaven, chasing down criminals while engaging in deep chats about their feelings and delivering hilarious one-liners at the most inappropriate moments. Set to return to the screen in the upcoming fourth film, these animated toy characters have an unbreakable bond. 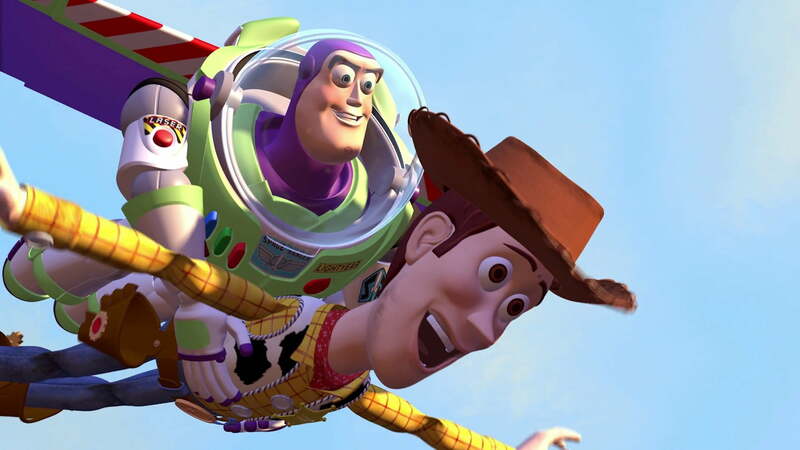 Buzz (Tim Allen) and Woody (Tom Hanks) started off as foes competing for their child owner’s attention. Eventually, however, they realized that once kids get rid of their toys and move on to adulthood, they can only count on each other. No matter which kid they end up with, these two are in it for the long haul, to infinity and beyond. If you’re comfortable standing outside a convenience store, smoking, selling weed, listening to tunes on a boombox, watching the world (and pretty girls) go by, and not even saying a word to one another, that’s the definition of a truly great bromance. Okay, so maybe there is some conversation, but it’s usually one-sided. 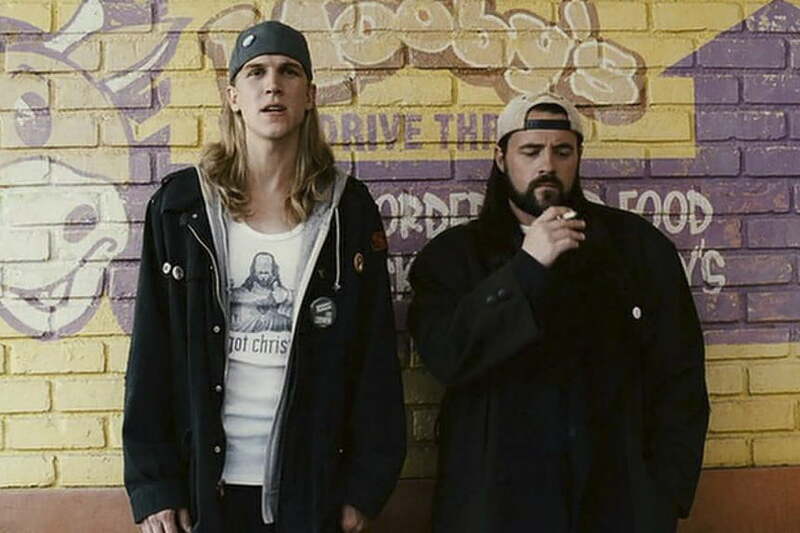 Jay (Jason Mewes) talks a mile a minute, and Silent Bob (Kevin Smith) usually responds only through gestures and facial expressions. Even time travel can’t tear these bros apart. William “Bill” S. Preston Esq. (Alex Winter) and Theodore “Ted” Logan (Keanu Reeves) are teenage metalhead slackers who get an education in history when they travel through time. Whether they’re playing air guitar together, trying to save the future of humanity — or just the future of their band Wyld Stallyns — they’re on the same wavelength and have each others’ backs. With a third movie, Bill and Ted Face the Music, reportedly in the works, and both Winter and Reeves expected to reprise their roles, this is a bromance that has stood the test of time in more ways than one. Arguably the most testosterone-filled bromance of the bunch, Rocky (Sylvester Stallone) and Apollo (Carl Weathers) spent much of their early friendship literally beating each other up. It was only after all of that fighting that they formed an unbreakable bond, built out of a rivalry that morphed into mutual respect. The bromance has persisted for decades, even in death, with Rocky training Apollo’s son in the latest movies. When you think about on-screen comedic duos, Harold and Kumar are near the top of the list. On their own, they’re each just pot-smoking slackers. Together, their quest to find delicious miniature burgers — and happening upon an exaggerated version of Neil Patrick Harris in the process — makes for comedy gold. Played by John Cho and Kal Penn respectively, Harold and Kumar fuel their friendship with drugs, fast food, and silly antics — and we love them for it. 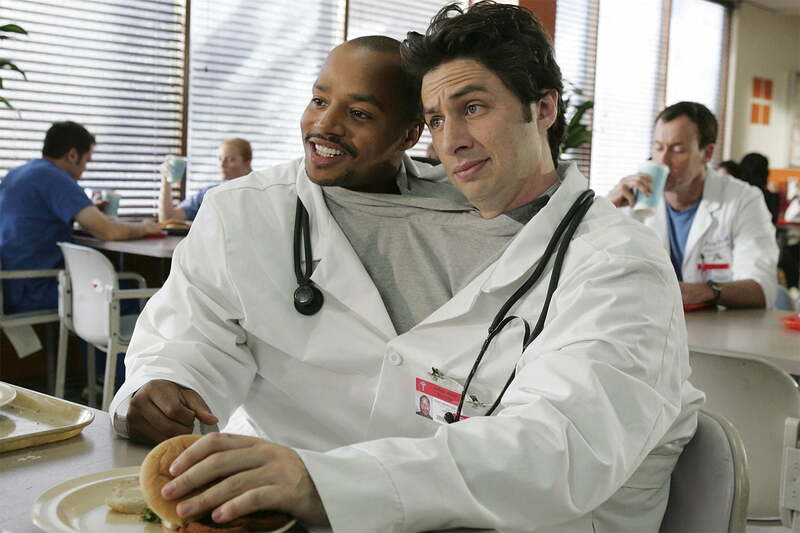 Friends since college and through medical school, Turk (Donald Faison) and J.D. (Zach Braff) continue their bromance into adulthood by working in the same hospital. Even their high-pressure careers can’t stop them from acting like silly college guys every now and then, celebrating their bromance through song and even giving one another pet nicknames like Vanilla Bear and Chocolate Bear.